Six boats, ladder launch, departed 19:25. Strong ebb. Big wake following a Clipper through Arch 2 of Blackfriars Bridge as Arch 1 closed. Reached Temple Steps c. 20:15. Returned Shadwell at 21:05, some headwind on return leg. One of numerous things I learned over a weekend in Wales. Ten of us went to Greenwich tonight taking it gently on the way and then splitting into two groups of five for the return leg. We in the 'fast' group kept a good pace and the return took about 25 minutes compared to 50 minutes on the way out (mainly due to having the tide with us). 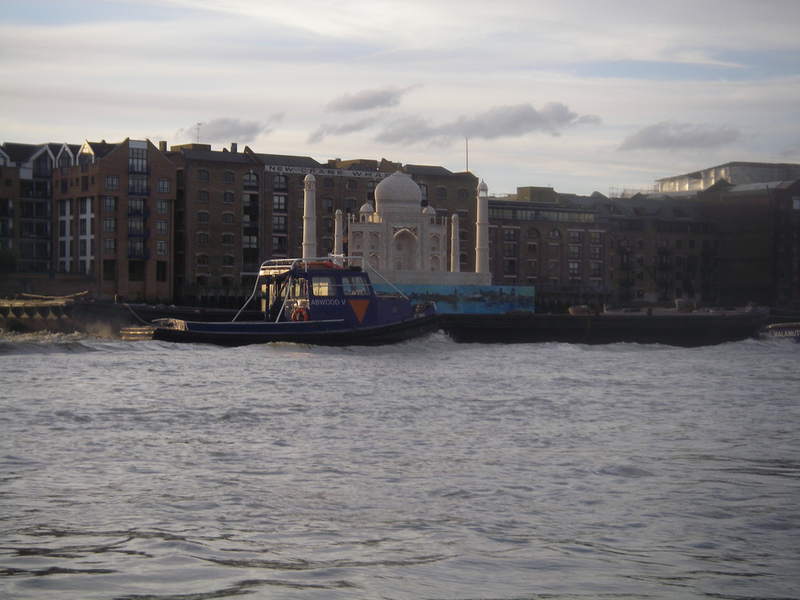 There was a lot of traffic and we encountered some quite choppy conditions on the way back in Limehouse Reach as two fast ferries passed at the same time in opposite directions. 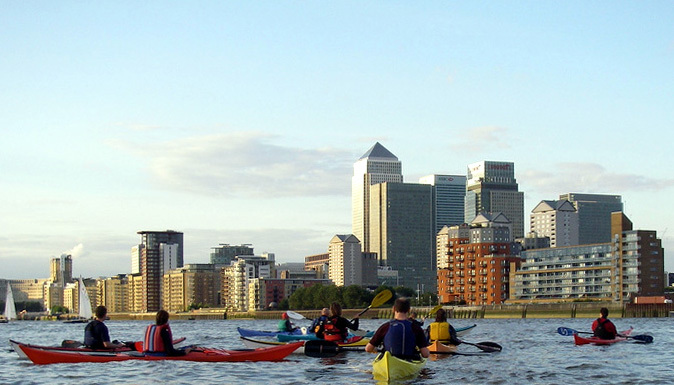 As the finale to our little intro to open canoeing course six of us set off last night for Limehouse Basin and a trip up the Regent's Canal. The idea was to add an element of journeying to the course and do something a bit more interesting than practicing strokes on Shadwell Basin. The logistics of getting boats to and from Limehouse within a normal Tuesday evening club session was the major challenge but, in spite of heavy traffic on The Highway, we managed a fairly slick operation and had an hour on the canal. There is good access to Limehouse Basin from Basin Approach off Commercial Road but parking in the Basin is not available (use Mill Place/Island Row instead). We paddled as far as the junction with the Hertford Union Canal at Victoria Park for a there and back distance of 4.6km. The new emphasis on open boating in the BCU's revised Star Awards has lead to a much greater interest in canoeing, as opposed to kayaking, within our club. This suits me well when it comes to my regular club coaching sessions as coaching open boating is a great opportunity to practice my own skills and it can be a lot of fun introducing people to something new. last night I offered an intro to open boats session and had five takers. They had varying levels of kayaking experience but only one had been in a canoe before so we started off just going for a paddle to see how they would get on with keeping a straight course. After a little experimentation we gathered round to discuss the results and I introduced the J stroke as a solution to keeping the canoe running straight. The small group gave me a chance to work with everyone individually for a few minutes and we made good progress with developing the technique. Working one on one really helps me to see the different learning styles and is a good reminder to try and deliver a session through a variety of learning channels. After some land based drills and a little more practice with the J stroke we moved on to turning strokes, taking the opportunity to introduce the idea of using bow and stern draws to turn the boat. As kayakers the group were familiar with draws but the idea of using them for steering was new. This led on to the pry and then the box stroke. I think they were quite surprised at how different some of the canoe strokes were to what they were used to. We finished up with some balancing games including standing and walking around the canoe and one of my favorite finales: the five canoe pyramid, which we paddled back to the dock. The session had covered a lot of technical stroke work (and even some knots), probably a bit more than I would normally do with complete novices but the kayaking experience of the group and their interest meant that they were able to take it all in. I enjoyed the session and am looking forward to introducing more of my club mates to canoeing. A relatively unremarkable paddle tonight. We set off from the beach by The Prospect of Whitby with the water fairly low and headed up river against the last of the ebb. We crossed the river at Tower Bridge and paddled as far as Gabriel's Wharf before turning around and returning to Wapping and a muddy landing just around slack water. High water London Bridge at 18:39 meant no beach to launch from so we launched, one at a time, via the step ladder just outside Shadwell Basin. It took nearly fifteen minutes to get nine boats on the water and it was 19:15 by the time we set off up river. We crossed to the Surrey side in front of Tower Bridge enjoying a good ferry glide across the quickly building ebb tide. The pace was leisurely, at least for the regulars, as we regrouped several times to let everyone catch up. We picked it up a little on the way back as the tide made easy going for everyone and returned to Shadwell Basin at about 20:45. The gentle pace meant I had plenty of time to chat, look around and enjoy the view. 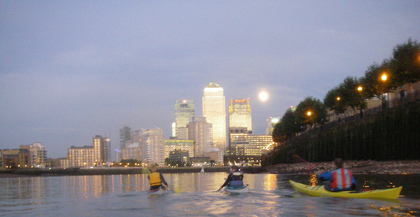 A lovely paddle on the Thames tonight from Wapping past Canary Wharf to Greenwich and back. The moon was spectacular and the river seemed calm and serene until out of nowhere the tsunami hit us. I heard a shout of 'wave' and looked over my shoulder to find Canary Wharf obscured by a wall of water. The wake from a fast ferry had reared up suddenly over the shallows while we were idly chatting but, for the sake of the one member of the party who it got the better of, we'll remember it as the Canary Wharf Tsunami! For the final week of our beginners course we were back in general purpose boats and concentrating on technical strokes: sweeps, draws, forwards and backwards paddling, low braces and low brace turns. It was quite a lot of content but the students seemed to soak it all up enthusiastically as it was nearly all new to them. We had two coaches and split the ten students into two groups for some of the session which made coaching in the dark much easier. Then we brought everyone back together for a good game of polo in which everyone got stuck in using their new skills. My grand plan last week had been to kick off the beginners course with a multi-disciplinary introduction to paddle sports, in line with the latest BCU philosophy embodied in the new star awards. In the event, the second week proved a better time to introduce different craft. Before the group arrived I selected a variety of boats including sea kayaks, general purpose boats, a river runner a play boat and an open canoe. This immediately generated interest from the group in what each one was for and we covered much of the theory section from the old star awards in just talking about the different designs. On the water I found that the sea kayak I had selected was a bit too tippy and we had some early rescue practice but otherwise the plan worked well with most people swapping into something different at least once. We did not cover as much technical stroke work as we normally would in a second session but I think we had more fun and broadened everyone's horizons. We finished up with everyone trying an exhilarating high seal launch from our ramp. Once a month we run a three week beginners course at THCC and Tuesday was the first session of our September course. We had a group of eight enthusiastic new paddlers and I coached the group with our L3 coach. I had a new plan for the session to coincide with the introduction of the new BCU star awards but got held up by the tube strike so that by the time I arrived there was no time to implement it. I'll try again next week. We reverted to our normal beginners session and made good progress helping people with the sometimes tricky art of paddling in a straight line. We finished up with some fun and games and, of course, a capsize drill. I have heard that at certain states of tide a standing wave forms just down river from London Bridge, where the river is shallow. Until now, I had never seen much more than a single small wave near the bridge's support columns but last night was the real thing. A group of seven of us set off from Wapping at 19:00 and headed towards Westminster, as low water London Bridge was predicted for 21:34. At Tower Bridge we crossed the river to the Surrey (south) side and as we paddled close to the bank from Hayes Galleria to London Bridge we noticed significant waves in the centre of the channel. There was a lot of river traffic about, however, and we assumed this was just wash. We continued our trip as far as a small sandy beach just shy of Waterloo Bridge where we usually stop for a five minute break before turning around. 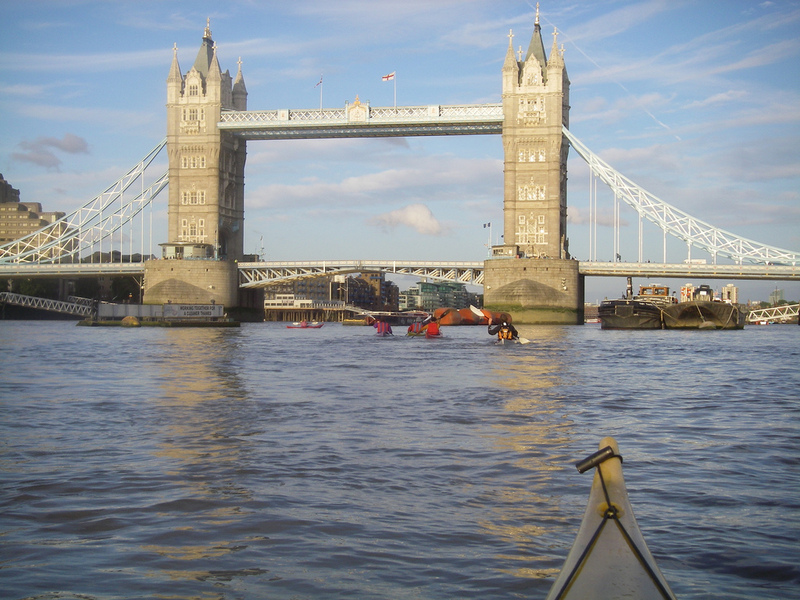 When we paddle back with the tide we usually keep a little further out in the channel to make the most of the flow so when we came under London Bridge we found that the waves we had seen earlier were still there and we were right in the middle of them. We enjoyed a roller coaster ride through a wave train from the bridge to London Bridge City Pier that was rather like paddling through a small tide race. The time was about an hour before low water and there was a slight easterly wind which probably helped to hold the waves up. I had been waiting for summer to try another family canoe trip but it has taken me this long to realise that summer 2007 has been canceled and not merely postponed. Greatham Bridge is a good launch spot for adults but it can be a bit tricky getting small children in and out of the canoe as the banks are steeply sloping and muddy but by climbing over the odd gate one can usually find a suitable spot. 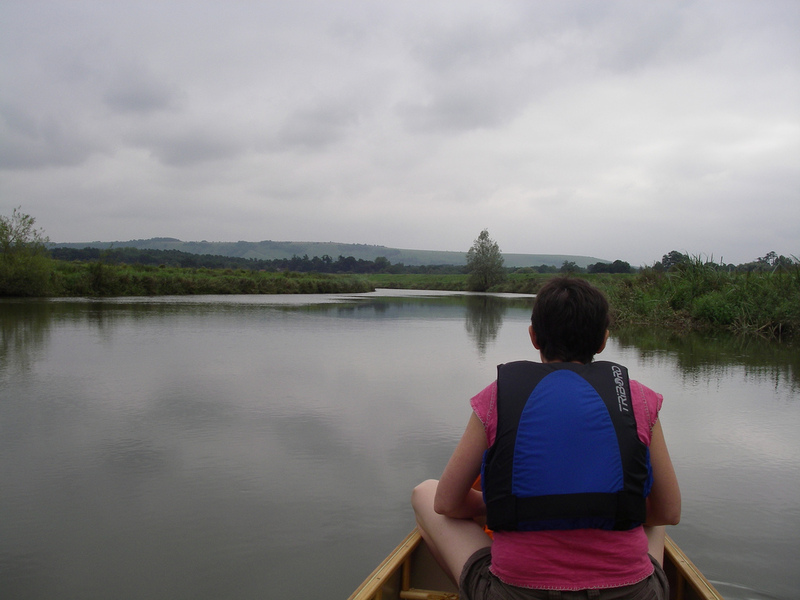 Once we were all safely aboard we headed up river against the ebbing tide towards Pulborough. I was paddling solo most of the way as my wife was too busy entertaining our youngest to help. Paddling four people against the tide is hard work and it took an hour and a half to cover the 5km to Pulborough. The return, with the tide, was a bit easier taking about an hour and afforded some lovely views of the Downs. Six of us turned out last night for a hard paddle into wind and against a fast ebb to Gabriel's Wharf. The wind was in the south west so we crossed to the Surrey (south) side of the river at Tower Bridge and found a bit of shelter but still had to work hard against the tide which was about and hour and a half into the ebb from a 6.9m HW level, so quite strong. We reached our destination in 46 minutes strung out like Tour riders on a mountain stage and were ready for a rest. We encountered some strong gusts on the way back and I had to clench my fists and hang on to my paddles a few times. As we approached Tower Bridge we noticed it was raised but didn't quite get there in time to pass underneath the open span, although we did see an old Thames barge come through. The journey back took 26 minutes but would have been a little quicker had we not been held up waiting for traffic before crossing back to Wapping. One of the things I love about paddling on the Tideway is that no trip is the same and one always sees something a bit different. Tonight it was this replica of the Taj Mahal being towed down river. It was a puzzle at the time but when I went home later in the evening I saw it again on the news and learned that it was a promotion for the start of the India Now festival taking place over the next three months. Yesterday was Wimbledon weather so only four of us turned out ready for a paddle on the river. It was a strongly ebbing tide and quite hard work paddling against it to Temple Steps. It was not made any easier by the heavy river traffic and wash although this did add some excitement, particularly as a police launch sped by - the river is not exempt from security alerts - creating very turbulent conditions. We made Temple Steps in 44 minutes and the return journey took 26 (10 km round trip). Tonight 13 of us set out on the river. This was a chance for some of our less experienced paddlers to explore the Tideway. We paddled as far as Deptford and back (about a 5km round trip).